This month’s Progressive Eats is different for me. As we’ve worked our way through each other’s virtual homes all of the events planned by our monthly host were themes requiring dishes that I was familiar with. I can make soup, Tex-Mex, barbecue and more. Tell me to show for an apres ski party and I’m on it but Asian? I’m probably not alone but my experience with Asian is limited primarily to Chinese takeout. Oh I’ve made what Americans think of as Asian food but find someone in Asia who is familiar with crockpot Sesame Chicken and I’ll change my tune. See? Oh…wait. I do have some wonton wrappers in the freezer; does that count? I actually love that Jeanette with the blog Jeanette’s Healthy Living chose this theme. It’s good to stretch ourselves and try something new so this was fun. First things first was to decide what to make and I called on my memory of hours spent walking through HMart; a local Korean specialty store. It is HUGE and every time I go there it is an adventure. I’m usually looking for a unique vegetable and never leave without a huge bottle of Mae Ploy Chile Sauce; it’s a kitchen staple. HMart is my best source for pork belly too; it’s a standard cut of meat for many Asian dishes, not just the latest trend at chi-chi restaurants. I use it to cure and smoke my own bacon so HMart is special to me. One of my favorite sections of the store is a small bakery. 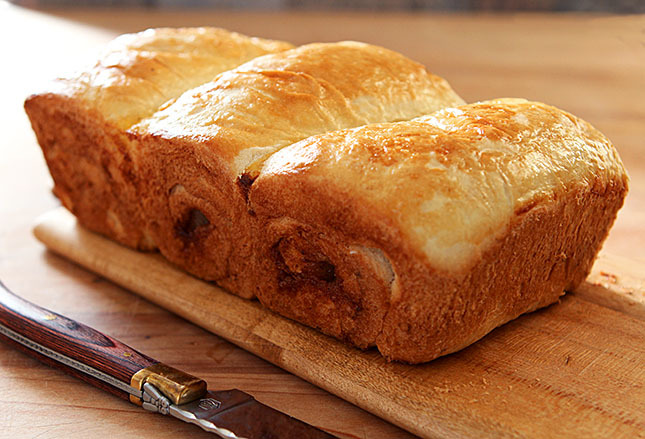 The French influence is obvious in many of the pastries made there but for me, one of my very favorite things are the Asian Rolls. Known by a variety of names including Asian Sweet Bread, Milk Bread, Hong Kong Pai Bao and Hokkaido Milk Bread. And it really is a sweet bread but not in the way that our morning pastries are sweet and covered with frosting. This is more subtle. And so wonderful. Still it was new for me and I had some anxiety about making it. But then bread always include some anxiety. Each and every time I pull off that linen dishcloth and see that the bread actually did rise, I whoop and holler like a kid with a new bike. Because I had never made it before and because I was making it yesterday, my anxiety level was even higher. But it worked and it was beautiful and it tastes so amazing; really you must stop everything now and get started! I don’t make enough bread; there is always that association with the time required. But the truth is that it takes very little actual time to bake; much of the vested time is actually just waiting for the bread to proof. If you are sitting by the oven looking through the glass door; OK, that might make it seem too timely. But work it in between your other responsibilities and it’s really not a big deal. The big deal about this bread starts with the scent from the oven. My home had that smell that is so wonderful that a person might wish for an aerosol version to spray throughout on those days when that urges hits us. 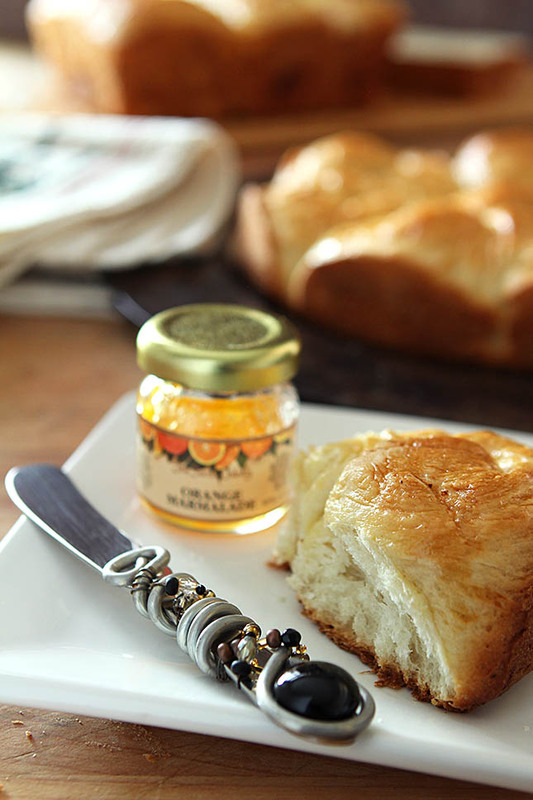 Spring cleaning, company, you name it…I want my home to always smell like Asian Sweet Bread. As much as I like to fiddle and make something mine; always revising a recipe along the way, for this I stuck to the recipe exactly; well sort of. The ingredients. Yes. The method? Pretty much…but it’s in the method I took a small detour. I decided to use this recipe and I while I’ve included this photo with some quick phone snaps, I would recommend you peruse that site for a bit too; I thought the photos of steps were excellent. One of the examples used half the dough, cut it into thirds and then created a unique loaf of bread with three small rolls put into a loaf pan together. As I rolled out the dough I was compelled to add a bit of butter and cinnamon to be rolled up inside. As I asked Jeanette our host, ‘East meets West?’ right? Hopefully in bigger and better ways than this but this was good. No, actually excellent. These rolls were perfect. Light and fluffy and just perfectly sweet. If you, like myself, have wanted to try your hand with an Asian inspired food; I heartily recommend trying this bread. It is so good…I think I hear a few slices calling to me now! And for more terrific Asian dishes, make sure you visit my friends sites too; I know I can not wait to try something else new to me. In the bowl of a mixer,add all of the dry ingredients and whisk together. Combine the cream and milk and stir; add to the dry mixture in the mixing bowl. Using the dough hook attachment, turn on the mixer to “stir.” Mix for 15 minutes, occasionally stopping the mixer to push the dough down. After 15 minutes of mixing, the dough is ready for proofing. Cover the bowl with a damp towel and place in a warm spot for 1 hour. (I use my oven; preheating to 200 and then turning it off before putting the dough inside). The dough should expand to 1.5X its original size. In the meantime, grease two baking vessels on all sides with butter. I used a standard loaf pan and a 9-inch round springform pan. After proofing for an hour, put the dough back in the mixer and stir for another 5 minutes to get rid of air bubbles. Dump the dough on a lightly floured surface, and cut it in half. I made a loaf with one half of the dough by cutting it into 3 pieces, rolling them out and then rolling them up before placing them in the loaf pan. With the other half of the dough, I cut it into eight equal pieces and made buns. Once shaped, let the dough proof for another hour. We have a core group of 12 bloggers, but we will always need substitutes and if there is enough interest would consider additional groups. To see our upcoming themes or see how you can participate, please check out the schedule at Creative Culinary or contact Barb for more information. Absolutely…sometimes WP pre-filling that field with http:// is bad; your URL was appended to it! Fixed and thank you…love that bread! I I love this Asian bread recipe. 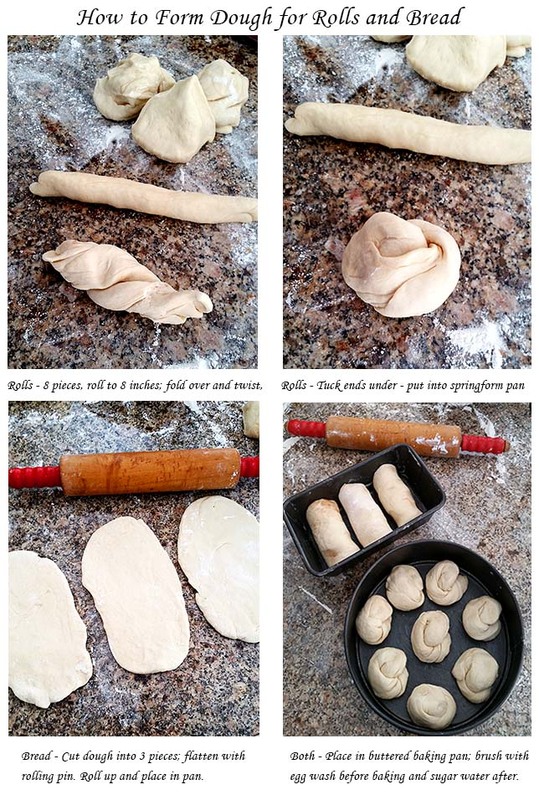 It’s quite similar to the brioche ensaimadas I bake during the holidays but yours is simpler. Your Asian theme is wonderful and I already enjoyed the other posts, esp. Laura Kumin’s! Thanks for sharing this Barb! You know what…Brioche is what it reminds me of! You must try it; so good! 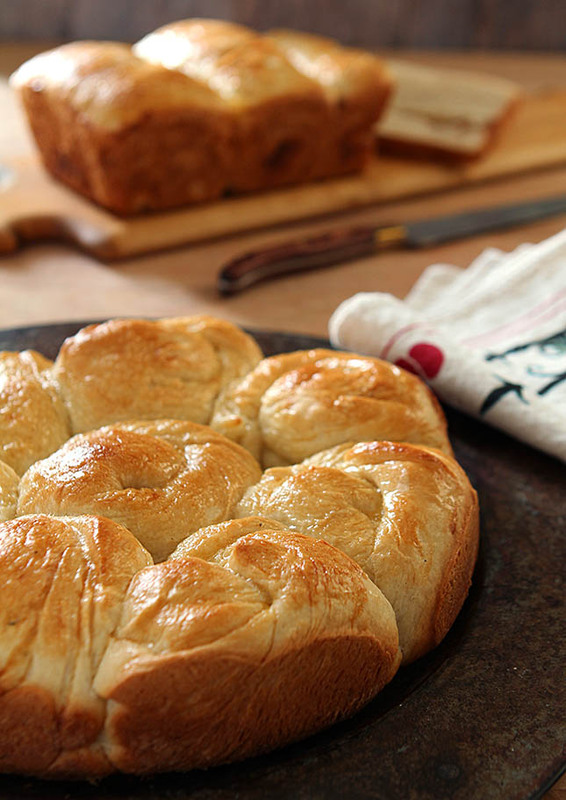 I want my home to always smell like Asian sweet bread, too! I love how soft and tempting this is. It’s been one of the things on my to-make list FOREVER. I always forget until I see it again. I’ve got to give it a go, your pictures are making me hungry. Right? It is all those things too; soft and tempting and just perfectly sweet…you MUST make it! I fell in love with baking bread when i was in school. And i’ve made lots of sweet yeasted breads, but this looks different from them. I would love to try this– and i love their shape. Going asian this month was definitely out of my comfort zone, but so, so fun to explore! I’ve been baking bread forever too; my first experience was with a friend I met after my first child was born and she is 35! I do love how this is kneaded using a dough hook; I live with ‘almost carpel tunnel’ and anything repetitive brings it out so I can’t knead for 15 minutes at a time like I used to…and seriously I’m OK with that and SO glad I can still get results like this. I really don’t do Asian Sweet rolls/buns/breads. Need to get out of my rut! This looks superb. Love the light on the photos, too. This would be a great one for you to try John; I researched a lot of recipes but this one was relatively simple and the results were superb. YES; let’s do it. You just tell me when and I’ll be there! These rolls look delightful Barb! Pinning these to save for later, can’t wait to make these in my own kitchen. The technique is really easy; even the shapes; and would be perfect with some of your jam Wendy. I say DO IT! I do think they are a chain Laura because I know lots of friends not in CO that are familiar with them. I remember my first visit. It was like an Asian Costco when I was expecting a little storefront Asian market. It is always a fun experience. You really should try this bread; it is simply divine. Wow this looks amazing! I love HMart too. I’m so impressed that you made this so last minute – it looks light and tender just like the Asian sweet breads I’ve seen. And I love the touch of cinnamon ;). I had certainly planned to give myself more time but you know how things go sometimes and it didn’t happen. Trust me I had them all crossed; fingers, toes and eyes because I had no safety net; it either worked or I was in big trouble! I loved that it was meant for a stand mixer and a dough hook; I’m not sure I would have jumped onboard with 15+ minutes of hand kneading! Asian food is pretty exotic for me too, Barb. Like you what I enjoy in Asian restaurants here is probably not what folks in any of the countries actually in Asia eat. I eat Asian-ish. But I had great fun with this as well. I love this style of bread. Rolling each piece up to put in the pan is supposed to result in feathery, long strands of gossamer bread–a more “vertical,” with the grain crumb. That seems to be the aesthetic in Asia whereas in the US, we prize the cross-cut crumb. Interesting how we can alter techniques to end up with the result we want. I love that you rolled yours up with some cinnamon sugar! Good plan! Amazing crumb; more brioche like than our standard breads. Now it is truly a new favorite recipe. I think next time I might try a cinnamon topping; more coffeecake like, the experiment with filling those small rolls was just that; an experiment and results were negligible. Not enough roll; not enough cinnamon!